The 4th annual Xmas Exhibition launches tonight and walls will be groaning under the weight of amazing artwork from Irish artists, graf writers, illustrators, photographers, painters and more. le cool Dublin magazine have joined forces with the people behind the irish Street art book 'A Visual Feast' to bring you a bang up to date selection of local artists and their work. 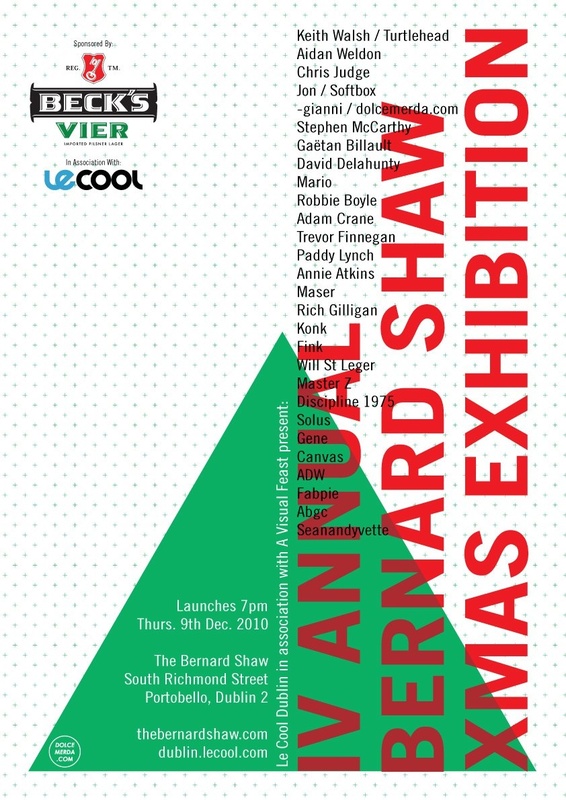 Turtlehead, Maser, Chris Judge, Gianni Clifford, Gaetan Buillault, Rich Gilligan, Stephen McCarthy, Softbox, David Delahunty, Gene, Will St Leger, Robbie Boyle, Adam Crane, Trevor Finnegan, Paddy Lynch, Annie Atkins, Mario, Sean, Aidan Oliver Weldon and loads more. We will have two pieces of art for sale at the event: NB - 50% of all proceeds go towards the Simon Community so this is a very worthwhile event. Piece one: "Belfast", a 16x20 inch photograph passpartout mounted in a solid black frame measuring 19.75 x 27.5 inches. Piece two: "Drawer", a 16x20 inch photograph passpartout mounted in a solid black frame measuring 19.75 x 27.5 inches. Launches 7pm, with complimentary beers provided by Becks. CASAYH look after the music tonight with a live show from Market Force and DJ set from Alan Taylor. Check out their Facebook event listing here.